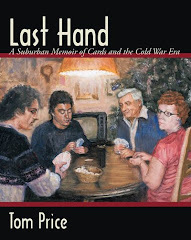 Special editions of the new Chicagoland memoir, Last Hand: A Suburban Memoir of Cards and the Cold War Era, will be available at Frontier Days in Arlington Heights on July 4th and 5th. Last Hand looks back at a lifetime of relationships lost to the passage of time in this witty memoir of family life in the northwest suburbs of Chicago during the Cold War. The book provides a snapshot of American life of a bygone era as the reader takes a journey back to a time before laptop computers, digital TV, and cell phones and experience the carefree summer days of the 1970s, attends public school, enjoys holiday traditions, rides along on a summer road trip, and sits in on a game of the all-but-forgotten (but once popular) game of pinochle. Because the story takes place in Arlington Heights, a one-time Special Edition of the book has been printed for the Festival and will be sold at a 25% discount for those people visiting Frontier Days. 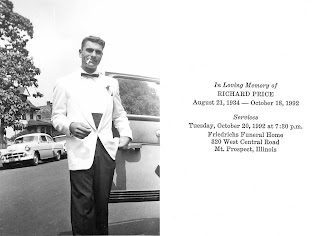 Remembering Dad this Father's Day. Those words ring all too true in America today. Every intrusion on our freedom by the government (either State or Federal), at least since I’ve been born, has been done with good intentions. The various “Nanny State” initiatives were all enacted to save me from some bad consequence and in some ways even from myself or from my family. We have a very thoughtful government here in Illinois, when they are not lining their own pockets. So it shouldn’t be any surprise that when an Illinois politician takes the White House that he shares that love with the rest of the nation. And there is no time to lose. I’ve seen our potential future. In the summer of 1987 I stood at the Berlin Wall. I was in Germany for the Reunification and in the fall of 1990 and during 1991 and 92, I toured many cities in East Germany and saw what shambles the SED (Sozialistische Einheitspartei Deutschlands = Socialist Unity Party of Germany) left behind. The country was broke, the currency was worthless, buildings everywhere were in disrepair, and even the streets that rivaled Illinois for pot holes. As I walked down the streets of Leipzig, I could only shake my head at number of video cameras on the street, used to watch the citizens every move a few years earlier. East Germany was a police state that didn’t tolerate dissent and interfered with peoples’ personal lives, if they were deemed a threat. But the Stasi (State Security) watched them anyway to be sure they weren’t. 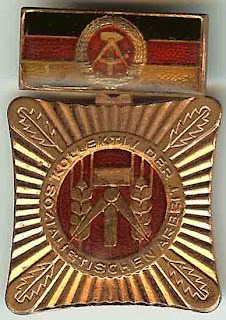 I believe the members of the SED loved their country. Like an over-smothering parent, they watched and dictated every move their children made – because they “knew” better. But they didn’t know better. A government doesn’t really ever do anything well and efficient. One reason is because of the lack of competition. In the event there is competition, instead of becoming more efficient, it’s easier to change the rules to eliminate your competitors. Even if they eliminate competition domestically there are foreign competitors. In that case you might want to create or join a world organization defines the rules to your liking. The next thing you might do if people still don’t willingly join you is you lock them up or ruin their lives, just like they did in East Germany. There are times when government can be like a cancer, the more it grows, the more damage it does. The question in the United States today is; will we diagnose it in time? 5. Know what I mean, jelly bean? “Give me a hand, will you buddy?” asked Dad one afternoon during the summer of 1979. Dad needed me to help him with one of his many projects. This time he was making a table to use in our utility room, out of what seemed to be spare lumber in our garage. As always, Dad had a Viceroy cigarette dangling from his lips, as we measured and marked the two-by-fours to cut. We might make mistakes from time to time adding to the comical element of helping Dad. I’m sure I learned a new curse word or two during the process as well. Although I felt like it was torture at the time, those projects were some of the best father and son time we had. 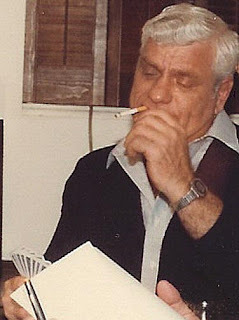 You could argue that smoking killed my dad but it was part of his personality. Both of my parents smoked. Both of my parents suffered health problems related to their smoking. I grew up around them smoking at dinner, playing cards, driving in the car, and during the odd projects we’d do around the house. I’m not a fan of smoking. I don’t smoke and have never been inclined to smoke. But I don’t hate smokers. Let’s face it, smokers are an easy target. I mean, who, besides another smoker, would sympathize with their plight. Well, ironically, me. You see, for me to accept the premise of the story by the Action on Smoking and Health and lawmakers of their ilk, I would have to consider my father and son time with Dad actually child abuse. And that would be a lie. As a student of German history, the smoker’s plight reminds me of the poem by Pastor Martin Niemöller, First they came…. There are several versions of the poem, but here’s my own version. First they came for the smokers I did not speak out Because I’m not a smoker. When they came for me, there was no one left to speak out for me. When it comes right down to it, I can walk away from secondhand smoke, but I can’t escape a Nanny State that suppresses free will. And eventually, neither can you. What a bachelor’s degree means today, the high school diploma meant in Dad’s time. Students who completed high school and became good American citizens were highly prized in postwar America. 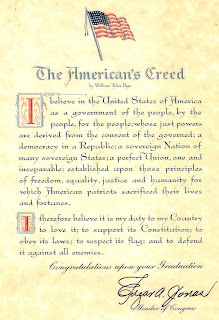 Upon graduation, each student at Nicholas Senn High School received a letter from his or her local congressman, Edgar A. Jonas, along with William Tyler Page’s “The American’s Creed.” I believe the goal was to reinforce a sense of community and duty to the United States during the Cold War. The Creed embodied everything that many Americans held sacred, such as love for America and its Constitution. Click on the image for a closer view. In honor of the quickly approaching Father’s Day, I’ve decided to add some stories of my father over the course of the next several days. Some of the stories will be funny and some serious but all have a message. While these are stories of my father, I don’t think they are necessarily unique to him, but reflect many attitudes of his generation as well as American culture of his age. I think the story below illustrates this best. While I was a college student in Murray, Kentucky, I didn’t own a car, and I only traveled home on vacation breaks. Dad always made arrangements to pick me up. On one such occasion, an acquaintance of mine called me to ask if I was going to Chicago for Thanksgiving break. She wanted to know if I could take a friend of hers to meet his sister in Chicago. I told her I could, and arranged a time to meet her friend. Her friend turned out to be a foreign exchange student from Columbia, aptly named Columbio. Columbio stood five foot seven, and was slightly plump, with dark hair and large glasses like Harry Caray. Although he was likely twenty-something, he looked like he was in his late thirties. I only spoke with him briefly, to arrange our departure time. Before we picked him up, I really didn’t know anything about him, other than he wanted to get to Chicago to meet his sister. I called Dad and explained we’d be bringing Columbio along, which of course was fine with him. It wasn’t unusual for us to drive other students to Chicago during school breaks. Dad arrived a day ahead of time, and we’d get dinner, before he picked me up early the following day. The day came for us to drive to Chicago, and Dad was right on time as usual, so we packed up and headed home. In the car, we began to make small talk with Columbio, which was a challenge at times as he struggled with the language. Dad was always a little funny around foreign students—he prompted them to tell him how much they liked America how nice it was to be here. In our discussions with Columbio, we discovered that he planned to get a hotel room somewhere in the city, then call his sister after his arrival and arrange to meet her the next day. Dad thought this was crazy. We had a spare room, so Dad offered it to Columbio, and told him we’d help him meet up with his sister. Columbio stayed with us that night, and the following day we headed to the studio at Columbus Plaza while we waited for his sister to arrive. As it turns out, she didn’t know the city very well, and it took some time for her to meet up with us. Dad played tour guide while we waited--he gave Columbio a map of the city and told him how to get around. Columbio probably understood a third of what Dad said, but it was a nice gesture nonetheless. We also carefully arranged the time and place to pick him up for the return trip to Kentucky. He really went out of his way to help Columbio, someone he barely knew. That was Dad—always sticking to the Golden Rule.